Pope Greets Vatican Staff and Families: Merry Christmas! Look at Who is Happy in the Nativity Scene – Who is Full of Joy! It was not your typical Christmas office party. In fact, it is likely the only Christmas party of its kind. On December 21, 2018, Pope Francis greeting the Vatican employees and their families in Paul VI Hall. The recognition didn’t go to the person with the highest sales or biggest profit, but to an altogether difference achievement. “Our Lady and Saint Joseph are full of joy: they look at the Child Jesus and they are happy because, after a thousand worries, they have accepted this gift of God, with so much faith and so much love. “Then, the shepherds are full of joy. The shepherds too are holy, certainly, because they responded to the announcement of the angels, they immediately rushed to the stable and they recognized the sign of the Child in the manger. Everyone is happy in the Nativity because they are “infected” with the joy of the occasion, Francis continued. And it was obvious those attending today’s event that they also were infected with the joy of the occasion. 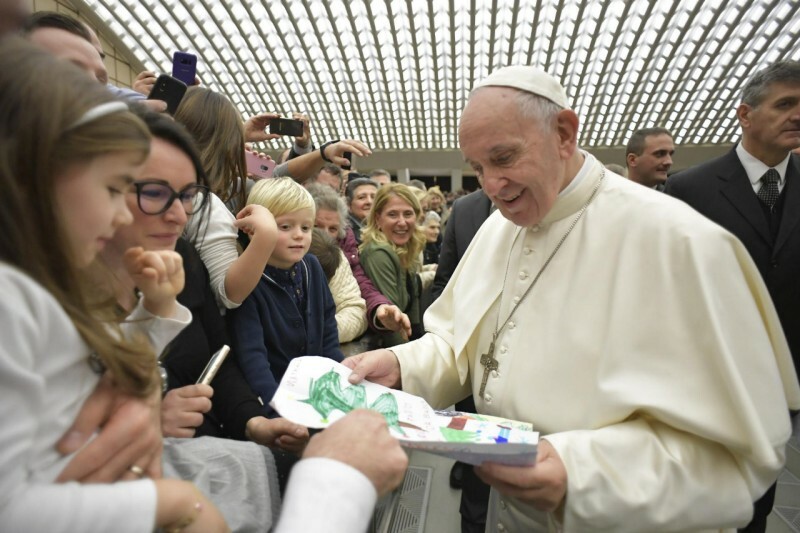 The Holy Father pointed out that there can be problems in the workplace: fatigue, gossip, a “heavy atmosphere.” But he praised the joy that so many of the workers bring to their daily responsibilities. They bring “serenity” to the job. “And where does that serenity come from? Always from him, Jesus, the God-with-us. He is the source of our joy, both personal and family, both at work,” Francis concluded. Thank you for coming, many also with family members. I liked greeting the family members, but the prize goes to the great-grandmother, aged 93, with her daughter, who is a grandmother, with parents and two children. The family is beautiful like this. And you work for the family, for your children, to raise your family. It is a grace! Safeguard families. And a Merry Christmas to you all! Christmas is a quintessential joyous feast, but we often realize that people, and perhaps ourselves, are caught up in many things and in the end, there is no joy, or, if there is, it is very superficial. Why? I was reminded of that expression by the French writer Léon Bloy: “the only great tragedy in life is not to become a saint” (The Woman Who was Poor, see Apostolic Exhortation Gaudete et exsultate, 34). Therefore, the opposite of sadness, that is, joy, is linked to being saints. As is the joy of Christmas. Being good, at least having the desire to be good. Let us look at the Nativity scene. Who is happy, in the Nativity? I would like to ask your children, who love to look at the little figures … and maybe even move them a bit, putting them in different places, angering their dad, who arranged them with such care! So who is happy in the Nativity scene? Our Lady and Saint Joseph are full of joy: they look at the Child Jesus and they are happy because, after a thousand worries, they have accepted this gift of God, with so much faith and so much love. They are “overflowing” with holiness and therefore with joy. And you will tell me: of course! They are Our Lady and Saint Joseph! Yes, but let us not think it was easy for them: saints are not born, they become thus, and this is true for them too. Then, the shepherds are full of joy. The shepherds too are holy, certainly, because they responded to the announcement of the angels, they immediately rushed to the stable and they recognized the sign of the Child in the manger. It was not obvious. In particular, in Nativity displays there is often a young shepherd, who looks towards the scene with a dreamy, enchanted air: that shepherd expresses the astonished joy of those who welcome the mystery of Jesus with a child’s spirit. This is a trait of holiness: to preserve the capacity to be amazed, to wonder at the gifts of God, His “surprises”, and the greatest gift, the ever new surprise is Jesus. The great surprise is God! Then, in some Nativities, the bigger ones, with so many characters, there are the trades: the cobbler, the water trapper, the blacksmith, the baker … and so on and so forth. And everyone is happy. Why? Because they are “infected” by the joy of the event in which they participate, that is the birth of Jesus. So their work is also sanctified by the presence of Jesus, by His coming among us. And this also makes us think of our work. Of course, working always has an element of fatigue, this is normal. But in my homeland I knew someone who never stopped working: he pretended to work, but he didn’t work. He didn’t make an effort, you understand! But if each person reflects a little of Jesus’ holiness, it takes very little, a small ray – a smile, a little attention, a courtesy, an apology – then the whole work environment becomes more “breathable”, does it not? The heavy atmosphere that sometimes we men and women create with our arrogance, closures, and prejudices is alleviated, and work improves, producing more fruit. There is something that makes us sad in work and sickens the work environment: it is gossip. Please, do not speak badly of others, do not gossip. “Yes, but I don’t like that person, and that one…”. Look, pray for him, but do not speak badly of him, please, because this destroys: it destroys friendship, spontaneity. And criticizing this person or that one. Look, it is better to be silent. If you have something against him, go and tell him directly. But do not speak badly of him. “Ah, Father, it comes naturally to gossip…”. But there is good medicine for not gossiping, I will tell you: biting your tongue. When the wish comes, bite your tongue and in that way, you will not gossip. Even in the workplace, there is “the holiness next door” (see Gaudete et exsultate, 6-9). Even here in the Vatican, of course, I can testify to this. I know some of you who are an example of life: they work for the family, and always with that smile, with that healthy, beautiful industriousness. Sanctity is possible. It is possible. This is now my sixth Christmas as Bishop of Rome, and I must say that I have known several saints who work here. Saints who live their Christian life well, and if they do something bad they apologize. But they go ahead, with the family. One can live in this way. It is a grace, and it is so beautiful. Usually, they are people who are not show off; simple, modest people, but who do so much good in their work and in relationships with others. And they are joyful people; not because they always laugh, no, but because they have a great serenity inside and know how to transmit it to others. And where does that serenity come from? Always from him, Jesus, the God-with-us. He is the source of our joy, both personal and family, both at work. So my wish is this: to be holy, to be happy. But not picture-postcard saints! Normal saints. Saints in flesh and blood, with our character, our faults, even our sins – let us ask for forgiveness and go ahead – but ready to let ourselves be “infected” by Jesus’ presence in our midst, ready to come to Him, like the shepherds, to see this Event, this incredible sign that God has given us. “I bring you good news that will cause great joy for all the people” (Lk 2: 10). Will we go see Him? Or will we be occupied with things? Dear brothers and sisters, let us not be afraid of holiness. I assure you, it is the path of joy. Merry Christmas to all!